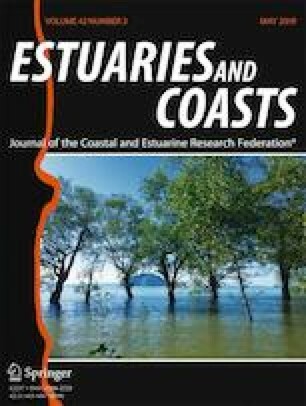 Freshwater discharge through the estuarine reach is always affected by tides and often composed of multiple distributary channels. The current estimation of freshwater input to the ocean by large rivers, therefore, is usually based on discharge measured at some distance upstream of the river mouth. Thus, records, however, may not truly reflect the river discharge to the ocean. In this paper, we consider the case of the Yangtze River where the furthest downstream gauging station is some 600 km upstream of the river mouth. Recent gaugings of the flow at Xuliujing, 69 km upstream of the river mouth, are used here to refine the estimate of the Yangtze flow to the sea. Given the errors in flow gauging, we consider only differences between Datong and Xuliujing > 15% as being significant. The results show that flows exceed this threshold on over 120 days with 63% being days when flow is larger at the downstream station. Most of these days with larger flow are in the period July to September, while most of the days when flow is less downstream occur in the period March to June. Annual flow differences between Xuliujing and Datong are only small percentages of the annual flow at Xuliujing for the years for which we have the records (1.78, 2.93, and 4.81% for normal, wet, and dry years, respectively) though these are still significant volumes of water. Local precipitation is the main driver of flow increases between Datong and Xuliujing in the July to September period, while water abstraction for irrigation between March and June appears to be the main cause of water loss in this reach. We recommend that water budgets for the tidal reaches of large rivers around the world are needed to accurately determine freshwater discharges from the rivers to the ocean and their temporal patterns. Xuefei Mei and Min Zhang contributed equally to this work. We gratefully acknowledge Professor B. Finlayson at the University of Melbourne for proof-reading the manuscript. We are also very grateful to Professor Isaac Santos and the anonymous reviewers for their constructive comments that helped to improve the previous manuscript. This study was jointly supported by the National Natural Science Foundation of China (NSFC) (41706093;41701001;41576087), the Open Fund of the Laboratory for Marine Geology and Environment, Qingdao National Laboratory for Marine Science and Technology (MGQNLM201706).